When Heston Blumenthal decided to take over the premises of his third restaurant in the village of Bray, in 2010, there was a certain amount of uproar between the local villagers. Fifteen years beforehand, the celebrity chef famed for his idiosyncratic approach to food and molecular gastronomy purchased The Ringers pub and turned it into The Fat Duck, which has since gained three Michelin-stars and was named the World’s best restaurant in 2005. Next, not content with owning just one of the three pubs along the main stretch of the village, Blumenthal acquired The Hinds Head. 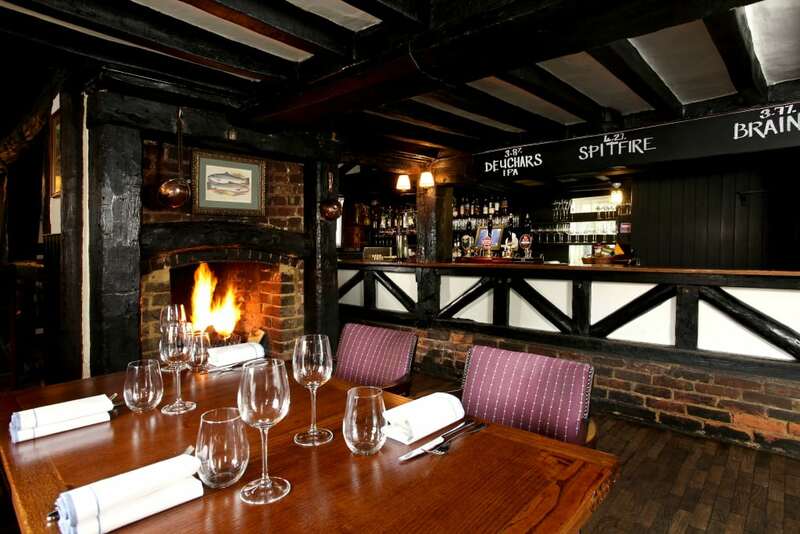 Slightly more accessible than The Fat Duck, and far easier to book, the 15th century “gastro pub” offers the chef’s take on British pub food, albeit to an exceptional standard – so good that the pub has held its Michelin star since 2013. Along with The Waterside Inn, Michel Roux Sr.’s three-starred gastro-temple, Bray’s restaurant scene now has a total of seven Michelin-stars. That’s an average of more than one per restaurant operating within the village. So when Heston decided to take over the village’s last remaining pub, the locals’ concern was understandable, fearing that Bray was rapidly turning into ‘Hestonworld’. Having visited three times within the past ten months, I’m still yet to witness swathes of Disney-fied mascots with oversized hands, feet and bald heads, wearing lab coats and glasses that resemble laboratory goggles. However, the fact that the village has become on of the UK’s most celebrated foodie hubs is certainly inescapable. Upon visiting The Crown, though, it’s refreshing to find that the latest addition to Heston’s Bray empire is a far-cry from The Fat Duck or The Hinds Head, even though both restaurants are within sight of the front door. Inside, the space is so traditional and in keeping with the quintessentially British pub, that upon entering I feel as though having stepped back in time. It’s not too dissimilar to the bar at The Hinds Head, though in the dining area there’s not a tablecloth in sight. What’s most surprising, however, is the fact that The Crown has not lost its identity – ultimately remaining a classic public house – it just serves pub food that’s of a very good quality, albeit very reasonably priced, especially when compared to The Fat Duck and The Hinds Head. There’s also a reasonable selection of real ales, including the pub’s own brew IPA available on tap. Unsurprising from a famed nostalgia enthusiast, the food menu reads like a tribute to classic British pub food, with starters such as king prawn cocktail and potato and leek soup: dishes rarely seen in restaurants since the early 1980s. A humble dish of ham hock and confit chicken terrine was plated as prettily as can be, accompanied by a salubrious portion of delightfully sweet piccalilli, carrying enough sharpness to stab through the fattiness of the pork. In contrast, a trug of seasonal vegetables, a healthy option perhaps, were simply joined by a dipping bowl of bagna càuda: a classic Italian dip with plenty of garlic, salty anchovies and butter. Culinary simplicity is absolutely fine, providing that each element has been executed well, and in this instance both dishes delivered. Next, a main of Iberico pork collar was served atop a hulking mound of crushed potatoes big enough to feed a family of four. Commendably, instead of choosing a more expensive cut of pork, the fatty collar allowed the nuttiness of the Spanish premium pig to shine through quite spectacularly. My friend’s thick tranche of roasted cod, on the other hand, had been cooked extraordinarily well and arrived atop a pile of ominous looking sea vegetables, delivering a salinity that worked in harmony with the delicate fish. These were joined by lashings of rich brown butter and tiny shrimps the size of sea monkeys to finish the dish with a level of decadence that can be perhaps expected from Bray’s Millennial dining scene. To finish, earl grey panna cotta had set just right and came with some heavily citric lemon crumble to cut through the cream, while the tidiest Eton mess I’ve experienced was also one of the finest I’ve tasted – with a generous helping of fresh strawberries to accompany the sweet globules of meringue and thick whipped cream. While The Crown does not necessarily serve food that’s on the level of his other two Michelin acclaimed locals, Heston’s humble village pub is everything that’s promised. The unpretentious nod to tradition at The Crown is also refreshing in a time blighted by so many pubs being taken over by soulless chains. Long live the Great British public house. The Crown can be found at High Street, Bray, Maidenhead, Berkshire, SL6 2AH.